In a small pan��over medium heat melt 1 stick of butter and 2 (1 Ounce squaresof unsweetened chocolate). Set a side and let cool slightly. In a bowl mix 2 eggs , 1 cup sugar 3/4 cup flour and 1 teaspoon vanilla. Slowly mix in the melted chocolate. 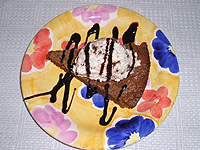 Pour in a greased pie pan and bake at 350*F for 20-30 Minutes when you take out of oven cut like pie and place a scoop of ice cream on and decorate with chocolate syrup.